After a valiant effort at reorganizing and consolidating my spice supply a couple of weeks ago, it occurred to me that there were probably a lot of more aesthetically-pleasing and accessible ways to store them. And there are definitely a lot more economical ways to navigate the spice market. Let's explore them, shall we? Here are the top 25 spices you should have in your kitchen if you are attempting to be a proficient home cook. 2. Apple Pie Spice ( a combo of cinnamon, allspice, nutmeg, and ginger. 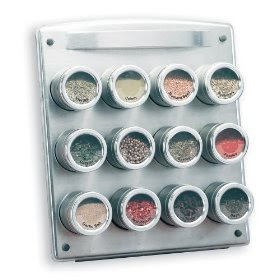 If you have all the others you can mix your own and decrease the size of your spice rack by one). 18. Peppercorns- seriously, buy a pepper grinder and grind your own. You will never go back. *Update: for those of you wondering what was up with the funky numbering (now fixed)- I wasn't trying to send you secret messages in code. I sorted them alphabetically, and thought that the numbers would reset automatically, but apparently that wasn't the case. Sticklers! 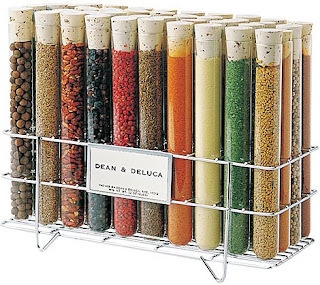 There are several online retailers that sell superior spices at way-reduced prices. I am a huge fan of Penzey's which provides delicious seasonings and great vanilla extract for a good price. Or you can buy them on an as-needed basis from the overpriced spice aisle at the Supermarket. It's up to you. I recommend only buying 1-2 ounces at a time, since spices lose their potency after about a year or two. Unless you are really into gingerbread, even in June, you aren't going to use up more than that. Smell your spices each time you use them. If they stop giving off a distinct aroma, it is time to replace them. Instead of shoving a bunch of odd-shaped jars into a drawer, why not use one of these attractive and useful storage methods? These magnetic jars can be attached to a metal plate on the wall, or just stuck onto the fridge. For a lower-priced option, you can buy these containers, and attach magnets to them with a hot glue gun. If you have more counter space than cabinet space, the Dean and Deluca beauty pictured above is as pretty as it is functional. 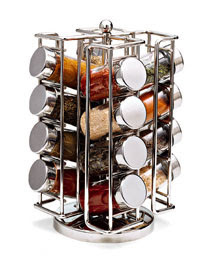 Or, this rotating rack keeps all your seasonings close at hand. Both of these racks are available from the Container Store. Wherever you store them, just keep them out of direct sunlight, which will age them faster. Now, that's a spicy blog post.